These days it doesn’t take a bunch of Marxists to alert workers that world capitalism is in deep crisis. There’s a mounting chorus from all the pundits that the world economy is facing the biggest crisis since the 1930s. 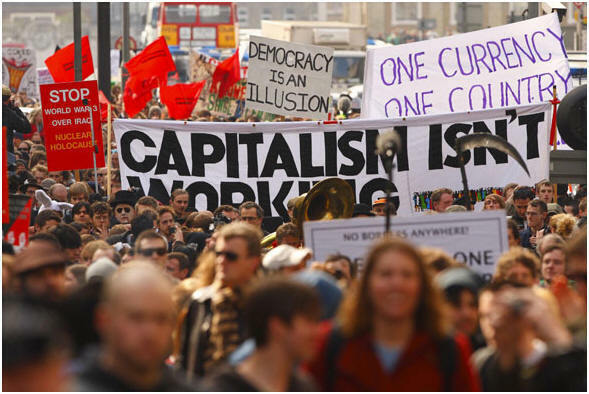 What they don’t tell us, or mostly don’t realise, is that the financial meltdown in 2007-8 was only the latest stage in a global crisis that capitalism has been trying to overcome for decades. The first big sign of the return of this inbuilt cyclical crisis was way back in 1971 when the US devalued the dollar. Marx explained that the dynamic of capitalist expansion creates a tendency for the average rate of profit to fall. Since capitalism can’t survive without profits, a falling ‘rate of return’ on capital is the basic cause of capitalist economic crisis. The only way the bosses can offset these falls is to increase the rate of exploitation of the working class. They call it ‘increasing productivity’. Way back in the 1970s and 1980s and on into the 1990s, wage workers found themselves fighting rearguard actions against being displaced by more advanced machinery. The new electronic technology threw millions onto the scrapheap — bringing permanent high levels of unemployment. In the UK and USA for example, the unemployment rate has never gone back to 1960 levels. For a time the new machinery helped to revive manufacturing and industrial profit rates, especially when it was transferred to countries like Mexico or China where labour was exceptionally cheap. By the 1990s globalisation was in full swing, including globalisation of the financial markets, aided and abetted by the new lightning communication systems which allowed transactions to span continents at the click of a button. As profits in the real economy faltered again more and more firms turned to making easy money through increasingly fanciful ways of financial speculation. A large part of the unimaginable sums gambled were simply based on fictitious capital many times removed from the original collateral. (Such as housing mortgages.) That bubble has burst but a colossal mountain of debt remains. Just about every government in the western world is preaching to workers about having to pay well into the future — through lower wages and reduced services — for this profligate past in which everyone supposedly shared. But the ‘all in it together’ propaganda doesn’t hold water. The present economic crisis did not spring from the debt mountain (although there were plenty of greedy bankers). The debt mountain stems from the longer-term crisis in capitalist production which today is more serious than ever. Somehow or other capital has to find a way of wiping out its debts, reviving the rate of profit and starting again with a new round of accumulation. What the pundits don’t tell us is that the crisis of the 1930s was only eventually ‘solved’ by the destruction of world war. This possibility may seem far-fetched. But think about how the world is shaping. Imperialist competition is becoming more naked than ever. The race between China and the West to secure raw materials and farm land in Africa, for instance, is nothing less than a repeat of the pre-First World War scramble for that continent. Although most of the world’s leaders would prefer to avoid the competitive currency devaluations and trade wars that preceded the last world war, this is just what is happening again today. This is partly due to the billions of dollars, pounds and euros that have been slid onto the balance sheets of the biggest banks, partly due to international currency speculation, but also a result of the sharpening rivalry between states for their exports to ‘remain competitive’. It’s only because just about every country is engaged in this race to the bottom that massive inflation hasn’t already been felt. Even so, all the world’s major currencies are being constantly devalued. Unlike the false reassurance given by Harold Wilson, Labour Prime Minister in 1967, when sterling was devalued, it does mean that the pound here in Britain, in your pocket or purse or in your bank, is being constantly devalued. In otherwords we get less for every pound we spend and any savings are worth less from one year to the next. The UK currently imports more than it exports. Bad news for the bosses in the international competition game. Bad news, too for the working class facing dearer goods in the shops, wage freezes, higher utility bills, devalued savings, general service and benefit cuts … not to mention the rising cost of two weeks abroad in the summer. Who said we are all in this together? It is in no interest of workers to join in the capitalist undercutting of each other’s costs, the prime target for which is wages! This capitalist horror story does not end here. The most dynamic system of production in history, one that has interlinked the world’s population so that we can truly envisage a global community, is also bringing the planet closer to environmentaldisaster. The famous ‘profit motive’ is a dismally inadequate starting point for tackling carbon emissions and limiting climate change. Here the full extent of capitalism’s interlinked crises and contradictions come together. China, for instance, heads the world in renewable energy spending yet it is the world’s heaviest polluter. There is currently enough food in the world to feed everyone yet millions of peopleare starving largely because they cannot afford to buy staples. When the financial bubble burst speculators turned to buying and selling food commodities, making the situation worse and directly encouraging the Arab Spring. Now that global weather patterns are increasingly erratic there is the real possibility of serious food shortages: don’t expect the speculators to back off nor imperialist competition to turn into peaceful cooperation between human beings. The fact is that all these crises are a spin-off from capitalism’s insatiable drive for profit, a motive force that is increasingly proving a threat to civilised life.